Primary motto of Carmel kindergarten is to ensure that students “explore and enjoy”in a safe and caring environment. We create an environment that promotes free expression, appreciation, enjoyment, discovery and development of individual talents. Housed in a colorful, stimulating and child-friendly building, Carmel kindergarten is designed for the development of various early learning skills in an informal and fun setting. The program is executed in a non-competitive environment through various guided activities such as games, field trips, indoor and outdoor activities that encourage self-exploration and learning. Our committed staffs are well trained in early childhood education. They assess each child’s development on a constant basis and provide training based on individual need. Carmel elementary focuses on building a sound foundation of a child’s character. Character traits like honesty, integrity, virtue and kindliness define a person. The learning continues to be fun and activity-based in a safe and friendly environment. 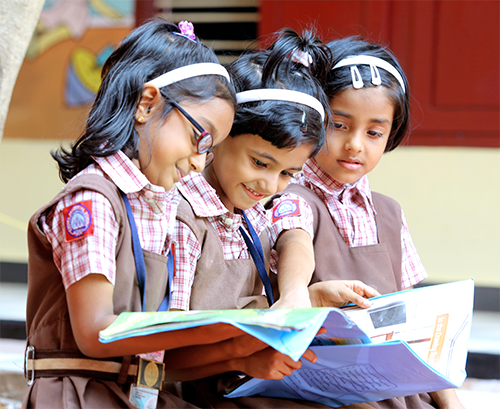 Emphasis is given in developing reading and writing skills at the appropriate level based on fun activities and stories time. 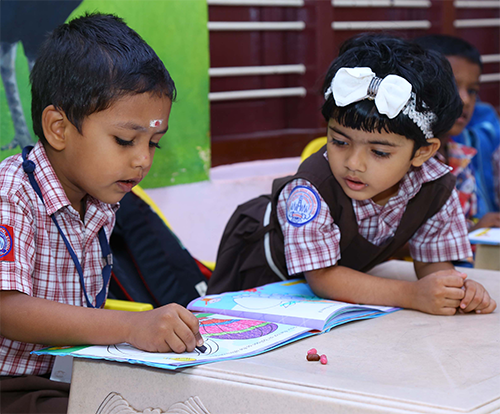 Art and crafts, physical activities, field trips, nature walks, indoor and outdoor activities are all part of the overall curriculum. Middle school years are a period of rapid development and transition. The children at this level have their own unique abilities, interests, aspirations and expectations. At this stage Carmel focuses on developing the student's personality. It is important to develop confidence, optimism, positive energy and a sense of humor. Therefore, our curriculum in these classes is structured to encourage and motivate them to become self-confident, self-reliant and self-disciplined, and thus help them achieve full potential. They are provided the opportunities to develop strong communication skills, participate in a wide range of cultural and sporting activities. The curriculum is expanded with additional emphasis to history, geography, sciences, languages, computer science and mathematics to prepare them to handle the additional demands in the high school. Periodic assessments are conducted and students are graded based on their performances. Counseling and interactive workshops and seminars on topics related to adolescence are conducted to help students with easy transition during these development years. The students of the secondary and senior secondary schools are trained based on the Central Board of Secondary Education (C.B.S.E) curriculum. In addition during these years students continue to participate in a wide range of cultural and physical activities. The primary focus during these years is to ensure that students acquire all academic, technical and soft skills. School follows a system of continuous evaluation and regularly provides parents with an assessment of their child’s academic progress, based on a comprehensive system of reviews, reports and parent-teacher meetings. High school years are the most important years of a student’s school life where decisions regarding the choice of a career have to be made. Hence career counseling and training also forms an integral part at this level.